Call your friends or talk to Siri, just don't eat it. The Banana Phone is the $40 accessory you definitely don't need—but that doesn't mean you shouldn't buy it. Bluetooth earpieces are so 2005. Shouting commands at your smartwatch, cool in the movies but not so much in real life. Putting a banana next to your ear and talking into it, now that's a-peel-ing! Okay, that was a terrible joke. The Banana Phone, however, is anything but. It is a very real, $40 Bluetooth-capable accessory that pairs with your iPhone or Android smartphone and allows you to place calls. Not only place them, but actually carry on a conversation with the person on the other line. It can also receive calls (wouldn't be much of a "phone" otherwise, right?). Ridiculous as the concept may be, the Banana Phone is a very intuitive piece of hardware. The device has an earpiece near the stem and a microphone close to its end. In the center there are three buttons: two volume keys and a "home" button. The home button serves multiple purposes; it answers calls, places outbound calls, and pairs the accessory with your phone. How do I place calls with just one button? you may be asking. Like the rest of the Banana Phone, it's quite simple and ingenious. Pressing the home button activates your phone's AI assistant, which you can then command to call the contact or number you're interested in. It's that easy. Continuing with the features, the Banana Phone is rated for up to 10 hours of talk time or 70 hours of idle time. 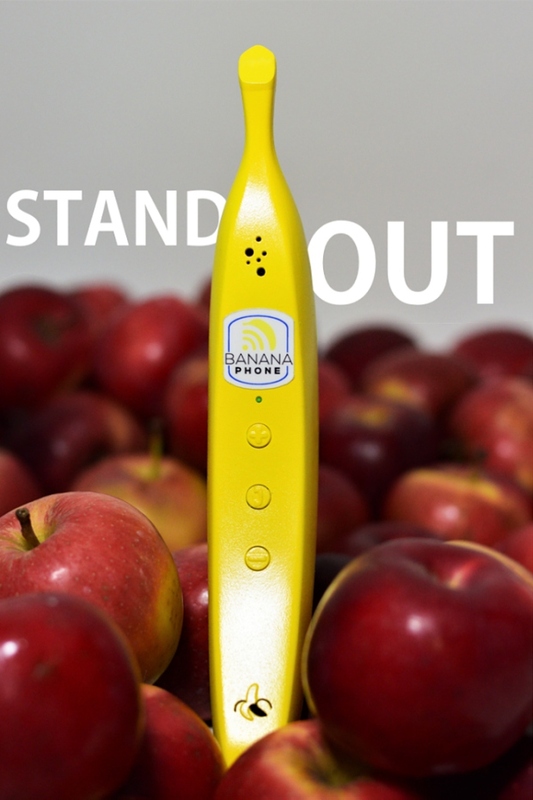 It has a built-in rechargeable battery and a standard micro USB port on its bottom tip, which is very convenient in case you lose the included charger..
Because the Banana Phone is about the size of its real-life edible counterpart, you can take it with you virtually anywhere. It fits comfortably in a bag or backpack. You can also carry the banana in your pocket—just be prepared for a slew of inappropriate yet fitting jokes from friends and passersby. The Banana Phone isn't only about novelty and jokes though. A portion of the profits from every piece sold is used to help protect rare mountain gorillas in the Democratic Republic of the Congo. The donations provide funding and equipment for the rangers that make the conservation of these majestic creatures their daily mission. Also, the Banana Phone is made of 100% recycled materials, a bonus for those who are environmentally conscious. If you want a Banana Phone, you can visit its Indiegogo campaign page and back one of the available tiers. $40 gets you one banana with a charger, and higher tiers give you more bananas, plus exclusive perks such as t-shirts, stickers, and even a limited edition Banana Phone at the highest tier.